Scrubbers that remove Chlorine via specific neutralizing agents. Chlorine is a frequent byproduct in many chemical reactions. However, manufacturers are required by law to reduce or eliminate emissions of this poisonous gas. Turn to Pollution Systems for a high-quality Chlorine Scrubber built to fit your requirements. 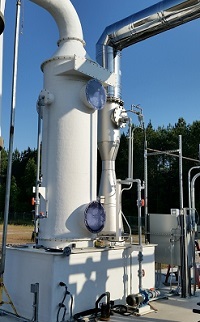 Wet Scrubbers remove pollutants by injecting liquid into the gas stream. For particulate systems such as Dust Scrubbers, the particulates are caught by water droplets as it enters the waste stream. In the case of Chemical Scrubbers, the liquid injected reacts chemically with the gas pollutant to strip it out of the waste stream. Efficiency is critical for Chlorine Scrubbers. Chlorine gas is highly toxic. Wet Chlorine Scrubbers may utilize a multi-stage removal approach depending on the initial pollutant loading. Some form of an alkaline liquid solution, such as soda ash or caustic, is generally used as a neutralizing agent. Removal efficiencies of the chlorine pollutant are controlled by a number of variables, including the design of the scrubber system, the concentration and amount of liquid recirculated and the process conditions such as temperature and flow rate. For Chlorine Scrubbers to work best, they must fit the application at hand. A manufacturing process that gives off chlorine gas may have other variables at play, including temperature, chlorine concen-tration and the presence of other particulates or other chemical constituents. Pollution Systems is a leading custom manufacturer specializing in Packed Column Wet Chlorine Scrubber systems. Our experienced designers are committed to developing Wet Chlorine Scrubber systems to fit your precise application and processes and provide you with a long-term solution with minimal maintenance needs. Pumps • Instrumentation & controls. 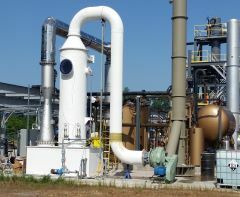 No matter how unique your specific challenge may be, Pollution Systems can design and manufacture a durable, long-lasting Wet Chlorine Scrubber system that will provide you with outstanding performance with low maintenance requirements.